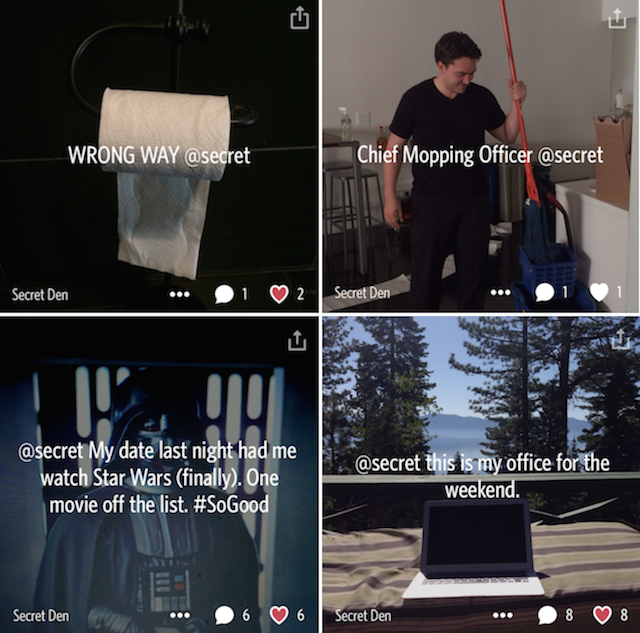 Anonymous social networking app Secret, a popular watercooler for Silicon Valley gossip, and now, much more thanks to recent expansions, has just announced a new feature called “Secret Dens,” which is focused on anonymous sharing in the workplace or in schools. The idea, explains the company via blog post, is to “share anything you’re thinking — kept within the walls of your workplace.” In other words, these internal Secrets wouldn’t ever spread more broadly to the wider Secret network. The feature is still in private beta, and has been tested at Secret’s headquarters where the now 16-person team has been sharing inside jokes, updates and more over the past month. Now, they say, the pilot project is beginning to roll out to a few other companies, but the eventual goal is to make “Secret Dens” available to more companies, universities and organizations in the future. The move comes at a time when other anonymous networking apps have taken off with the same demographic that Secret itself is targeting, most notably Whisper and YikYak, the latter of which faced a surge of growth, but also large-scale cyberbullying thanks to its pickup in schools. This is an interesting move for Secret, as its two top competitors here have shown to place a priority on moderation and reporting features in order to combat bullying as well as potentially “triggering” messages that could provoke some users to engage in self-harm. In Whisper, for example, the community heavily moderates posts and points some more afflicted users to its related non-profit arm, YourVoice, which reaches out to those who may be on the edge of suicide, for instance. Meanwhile, though YikYak perhaps naively didn’t think through the potential ramifications of an anonymous app aimed at a younger crowd, it quickly stepped in after news of its cyberbullying problem became national news to shut down its app from even working while on school grounds. It did this by implementing a series of geo-fences which now cover the majority of public schools across the U.S.
Secret, on the other hand, has struggled with bullying in its early days, allowing public figures in the tech industry (not necessarily “famous” people on worldwide scale) to be ruthlessly mocked for hours or days before the offending comments were removed, if they even were. Unless Secret has made significant improvements to its anti-bullying and reporting features in recent days, it may be too soon to introduce this in school zones, even if they are limited to the university level. One could even argue that younger users shouldn’t really be the target market for these kinds of apps at all, in fact. And if Secret-sharing in the workplace is introduced, it also sets up participating companies for a host of HR complaints in the future if the posts become negative or harass individuals by name. In a short Q&A at the bottom of today’s post about the private pilot program, Secret didn’t specify how it intends to handle these issues within Secret Dens.